Sailor collars are used for many different occasions. Small children wear them on nautical-themed outfits and women often have them on vintage dresses. Sailor collars are also popular choices for Halloween and anime party costumes. Making the sailor collar detachable means you can remove it and have more than one look for the shirt or dress. Make a pattern. Draft a simple sailor collar pattern on tissue paper or newspaper. Use the neckline of the outfit as a guide for the neck shape of the collar. Fold the pattern paper in half to draw the collar shape. This way each side will be exactly the same. Adjust measurements to the size needed for the garment being made. The bottom of the collar needs to end somewhere between the bottom of the shoulder blades and the center of the back. 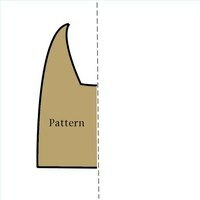 Place the pattern on the fabric and cut two pieces. One for the top and one for the bottom. Take ribbon and pin in place it about 1 inch from the edge of the collar on the top piece. Fold corners and press down with a iron to help hold them in place when stitching. Stitch the ribbon trim down to the top of the collar. Sew the outside edge of the ribbon first and then along the inside border last. Place the two pieces with right sides together. The ribbon trim will be in the middle, between the two pieces of fabric. Stitch along the edge of the collar using a 5/8 inch seam allowance. Leave a small opening to be able to turn the collar right side out after sewing. Cut the corners and clip the inner curves to help the collar lay correctly. Turn the collar right side out through the hole left open when stitching. Use a chopstick, knitting needle or similar object and make sure the corners are pushed out nicely. Fold the opening of fabric inside the collar and stitch the opening closed. Bring the points together and stitch. Place collar on over head and wear it over the shirt or outfit.